Matt The Letterhack And The Eternal Shame of Cap-Dudes - Wait, What? 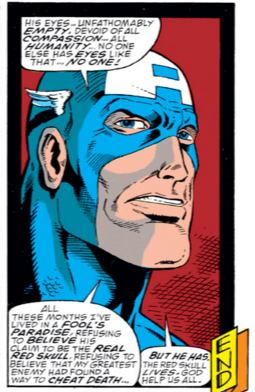 I’ve been doing a readthrough of a big chunk of the original Captain America series on Marvel Unlimited–basically, starting with the issues that kicked off the storylines that I remember from when I be came a regular reader and then, theoretically, through to the end. In practice this meant starting around issue #300, which is where the groundwork really starts for the replacement Cap storyline (#332-#350), which was where I started reading the book in earnest. I would drop off a bit later, then rejoin for Mark Waid’s series-ending run in the mid-nineties. This time, part of the goal is to plow through the issues I’d missed. It’s been a pretty dry exercise; most of these books are written by Mark Gruenwald and–not to speak ill of the dead–he’s a writer whose work has not aged particularly well. There’s a flatness of affect in all the characters, a weird joylessness to most of the issues (weird especially because Gruenwald has become legendary since his passing as a genuinely good, cheerful dude who had an encyclopedic knowledge of the Marvel comics he loved), and some pacing choices that seem incredibly odd by modern standards but that MUST have been clunky even back then. Things actually pick up after (SPOILER!) Steve Rogers retakes the mantle of Cap, when Gruenwald, with then-regular artist Kieron Dwyer, send him on a pulp, Indiana Jones-esque globe-trotting quest for a bunch of Bloodstone fragments. This kicks off a fairly strong stretch for the big, but it’s all still very comfortable stuff, toothless even at its very best (which is probably the the Acts of Vengeance crossover issue in which Magneto remembers that Red Skull is a Nazi; I would pay legit cash money to see Michael Fassbender and Hugo Weaving do a version of this issue onscreen). 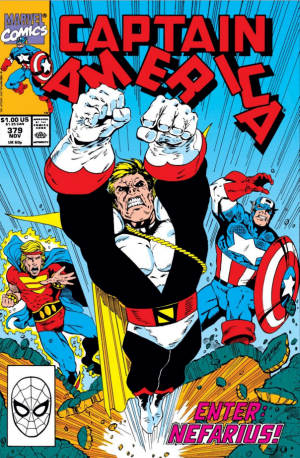 Basically, nothing here shocked me until I got to issue #379, a genuinely dreadful issue guest-starring Quasar (whose solo title was written by Gruenwald), with egregiously stiff fill-in art from Chris Marinnan underneath the “I can do that McFarlane thing too, I swear!” Ron Lim cover. The issue itself was bad enough that I was, by the middle, just swiping pages to get to the end, which may be why I stopped at the letters page; I don’t know. But I did, and there it was: a letter from then-13 year-old me, and holy god is it embarrassing. From one perspective, there’s not much to add to that. But, in longstanding bloggy tradition, let’s go through line by line and make fun of this hapless, sad writer. (Miss you forever, FJM!) Original text in blockquotes, my snark in plaintext. I realize this is thin defense, but it was 1990 and I was 13. I’m sure Cap-dudes sounded perfectly reasonable on the heels of Batdance and Bartman and all that cowabunga stuff. Ecto-cooler for everyone! So this is interesting, because I think I wrote the letter a month early: I remember liking Cap #370, but LOVING Cap #371. In this case, Cap (straitlaced man-out-of-time!) finally went on a date with Diamondback (pink-haired ex-criminal); villains kept threatening to disrupt it, and Diamondback’s friends (members of the shady Serpent Society!) prevented it while staying out of sight. It’s basically a superhero sitcom dramedy, and if you’ve been reading my writing here for any length of time, you know that’s right in my wheelhouse. Maybe I wrote a letter about that one, too. Thank god it didn’t get printed. Awesome! Ron Lim looks great! Is he going to be staying on? 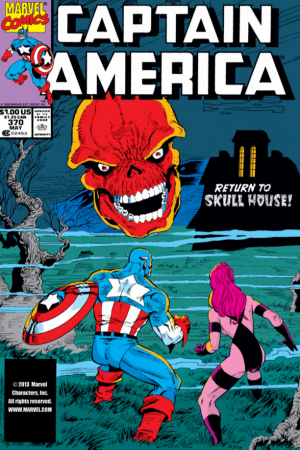 His Red Skull is the absolute best (except for maybe that McFarlane guy who used to draw the Web-slinger)! Few things here: 1) I legitimately loved Lim’s art when he came on this book; in hindsight I have no idea why. At the time I thought his work looked slick and fluid, where now it reads as stiff and awkward. 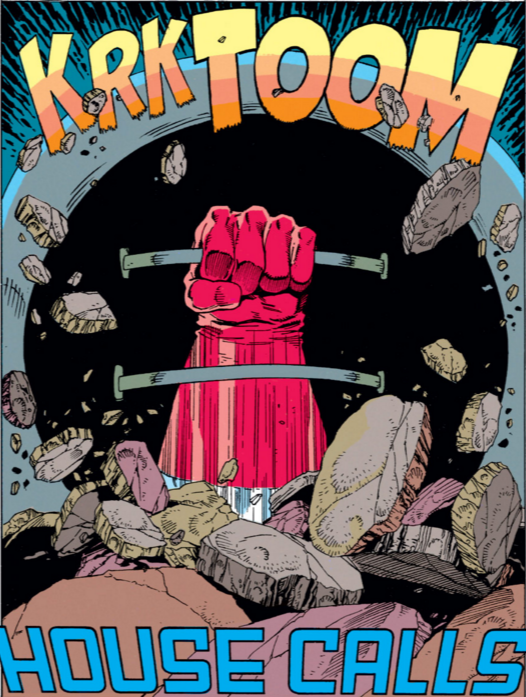 But looking at the splash page on that issue, of Cap’s glove and shield punching up through rubble, I can see why thirteen-year-old me was pretty goddamned psyched. KRK-TOOM! 2) Remember when there was no internet and WRITING A PHYSICAL LETTER TO THE COMPANY seemed like a reasonable way to find out about changes in creative team? 3) Not only does Lim draw a good Red Skull in that issue, he draws a fun display of the Skull’s old masks, each in the style of a previous artist, as if the changes to the mask were deliberate and not just because John Byrne couldn’t be bothered to draw like Mike Zeck or whoever. I loved that kind of thing then, and still love it now. 4) Lookit me talking about art before writing, something I regularly fail at now. 5) I still like Danny Bulanadi’s inks. He’s got a bit of Terry Austin to him, lots of fidgety little lines, but he regularly gave dynamism and early-90’s sheen (for better and for worse) to pencilers who looked dry and house-style-ish else where — Ron Lim here, Paul Ryan on Quasar, etc. Look at fiddly detail on the rubble around the shield in that splash page! Mark Gruenwald has created some interesting characters (Crossbones is a perfect example) and is putting some others to good use in this little Red Skull storyline (Machinesmith, Diamondback, and of course, the best villain in the world: the Red Skull. 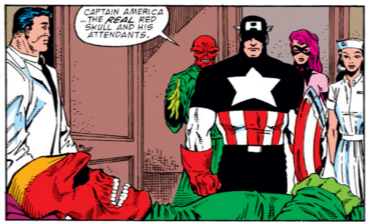 The greatest thing about the new, improved Red Skull is that you could use him in every issue. Any villain Cappy fights could be under the Red Skull. Come to think of it, so could every villain in the Marvel Universe! (diabolical cackle). 2) If I ever invent a time machine, after I kill Hitler and see Guns n’ Roses play live at the Whiskey, I’m going to travel to 1990 and smack younger me with a rolled up copy of one of the trillion mid-aught’s comics featuring Norman Osborn while screaming “SEE? SEE HOW THIS WORKS OUT?!??! BE CAREFUL WHAT YOU WISH FOR!!! !” Then I’ll tell him to buy Apple stock and come back home. All the characters were behaving perfectly, from Diamondback’s noticing that Cap called her partner. to the Red Skull’s reaction to seeing Cap. I don’t disagree with this, actually. The Red Skull, broken and near death, regains his will to live when he sees his hated enemy. It’s a nicely overwrought bit of melodrama. 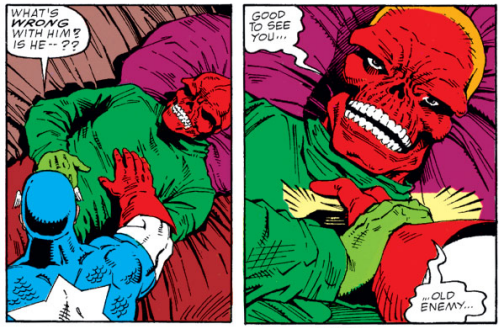 Up to this point, Cap has assumed that Skull is an imposter, and it’s only after his eyes come back to life in that second panel that Cap realizes the truth. Fun stuff! I love comics! Me noticing Diamondback noticing Cap calling her partner is also apt, but only because Gruenwald writes the lovestruck Diamondback with the emotional depth of a seventh-grader. One little piece of criticism. I’ve noticed that occasionally Cap’s costume is colored black around the star. That does not look very American to me. I am 99% sure I didn’t write this. No joke–I remember seeing this letter when it ran and thinking, “I didn’t say anything about the black coloring.” I’m assuming Marvel liked to sprinkle in a little healthy criticism in overly-gushing fannish letters just to make them palatable. I can only assume the editors who had to do this at the time now look at Twitter and laugh and laugh about how they used to have to make up negativity. Also, way to make me look like a jingoist loon with that “not very American” stuff, editors. Thanks loads. Well, anyway. 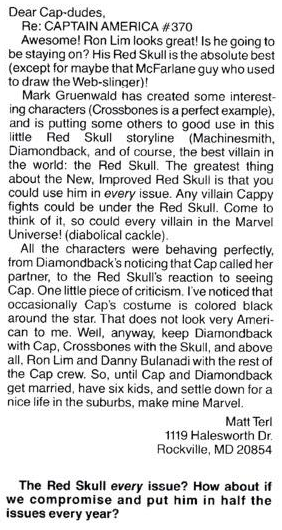 keep Diamondback with Cap, Crossbones with the Skull, and above all, Ron Lim and Danny Bulanadi with the rest of the Cap crew. I like to think I’m the reason Ron Lim got the regular gig. I’m quite obviously not, but I like to feel important. So, until Cap and Diamondback get married. have six kids, and settle down for a nice life in the suburbs, make mine Marvel. And what in the name of god was I doing putting my full address in there? Was I clinically stupid? It’s a miracle no one ever stole my house or whatever. [They respond:] The Red Skull every issue? How about if we compromise and put him in half the issues every year? Way not to even have the guts to respond to the criticism you yourselves inserted, Marvel. Why IS Cap’s costume colored black sometimes?!?!?? WHAT ARE YOU TRYING TO HIDE???? Anyway, the moral of this story is not to write letters to anything ever because one day three decades later they’ll get digitized and you’ll stumble across them and be gripped with an indefinable sense of skin-tightening shame combined with crushing sadness at the lost naivete of youth. Just stay at home, be quiet, and don’t communicate with anyone ever. It’s the only way to be safe. Wonderful read. You’re too hard on yourself. 13 year old Matt Terl writes well for his age. If you had bad taste, well, so do all 13 year olds. …oh yeah, and the villains were all losers like Gamecock and the Trump (a villain who is surely poised to have his comeback moment). Man, I loved that issue. I probably shouldn’t go back and reread it, for all the reasons you enumerate here. Honestly, that issue still held up fine. I’m BADLY stalled in the 380s, though. Man, is the Superia Strategem a slog. I think I lost track of the book right around there. Didn’t come back until Brubaker. Other than Remender/Romita JR’s ultimately disappointing recent run, the Gruenwald Cap is the only time I ever regularly picked up Captain America. And I won’t lie, it was entirely due to the long-running Captain America/Diamondback romance plotline. I was always a total sucker for the Serpent Society, picked up a few issues during the Bloodstone Hunt and got hooked when Diamondback became a regular member of the cast. Enjoyed everything in that book with her, the creation of Crossbones and a support crew for the Skull, and the date issue. I seem to remember that I fell off the book when she stopped being a regular, or maybe when they created that stupid Bad Girls Inc, which was just too stupid for me. Though now that I look back over Marvel Unlimited, based on which covers look vaguely familiar I think I may have held on through that, the awful Galactic Storm and CapWolf, and up to about 413 (maybe Modam was a bridge too far?). I’m tempted to give these a re-read on MU for nostalgia’s sake, curious to hear your further thoughts, Matt, on how these hold up. And so help me, I remember loving Ron Lim’s art at that age also (I was 13 too). Loved it on Cap, loved it on the cosmic stuff, loved it on Conan. In retrospect, his jawlines and gritted teeth kind of freak me out. It’s hilarious to me that you grew up in Montgomery County also. 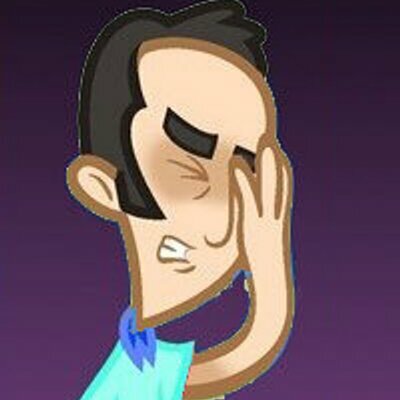 You are four years younger than me, so you would have been a freshman when I was a senior at WJ. Did you go to Churchill or Richard Montgomery? I was also reading those Captain America comics at that time. It would have been good to know that there were people in the area who I could have discussed them with who weren’t regulars at the Barbarian. I would’ve been Richard Montgomery, but went to Jewish Day instead. Barbarian, although one of my all-time favorite shops (in one of my favorite suburb/towns to this day — Wheaton forever! ), was too much of a hike for me, especially pre-car. I’m pretty sure at this era I was taking my bike across the brand-new (or not-yet-completed?) Wootton Parkway to Adventure Comics in Rockville. Have you been to the Barbarian since Carl sold it? It’s a shadow of its former self. I actually worked at the Barbarian in 1990/91. Hard to believe that was 25 years ago. I know it’s meant to be funny, but beating yourself up for your tastes at 13 just comes off as really unpleasant. Any embarrassment is just the natural effect of growing up and time passing — the comic book equivalent of “Oh my god, I can’t believe I had that haircut”. And any apparent loathing is just a side effect of my modern-day self-loathing. All of that said, I very much apologize — to both you and to 13 year old me — if I crossed over into unpleasantness.